A bronchoscopy is a procedure that allows the doctor to look inside a patient’s airways and lungs. There are two types of tubes that can be used to perform a bronchoscopy, a thin tube and a rigid tube. The doctor will insert a flexible, thin tube called a bronchoscope into the mouth or nose. The tube passes down the throat into the airways. 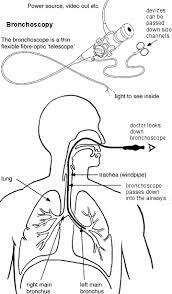 If the patient has a breathing tube, the scope can be passed through the tube to of the airways. The patient will be given a mild sedative to help them relax and feel sleepy during the procedure. 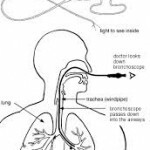 The bronchoscope has a small camera and a light that will allow the doctor to see the airways and the windpipe, the camera will take pictures for further investigation by the doctor. If the patient has a lot of bleeding in their lungs or a large foreign object lodged in their throat, the doctor may have to use a scope that has a rigid tube. This type of tube, which is passed through the patient’s mouth, is wider. This will allow the doctor to see inside the airways and lungs easier. The doctor will then be able to remove the lodged foreign object or treat any bleeding. A rigid bronchoscopy is done in an operating room under general anesthesia. General anesthesia puts you to sleep for the procedure. The doctor may take samples of tissue or mucus from the lungs to be tested in a laboratory so he/she can make a diagnosis. Often times, a doctor will use a bronchoscopy to treat a problem with the lungs. Sometimes, the doctor may use the procedure to insert a stent (a tiny tube) in the airway to hold the airway open for easier breathing. The stent may be useful in helping the patient breath if they have something that is blocking the airway and cannot be removed immediately or at all. After the bronchoscopy procedure the patient may experience a sore throat or nose where the tube was inserted. A bronchoscopy is an excellent procedure for diagnosing and treating conditions of the lungs and airways.